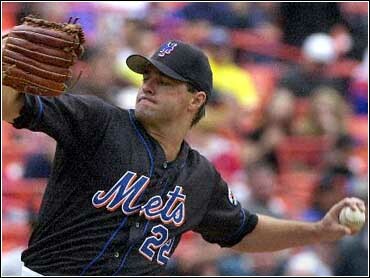 Al Leiter kept blanking the San Francisco Giants. The trouble for the New York Mets was that Livan Hernandez was shutting them out, too. Robin Ventura, battling a season-long slump, finally broke through, hitting a go-ahead double in the eighth inning to lead the Mets over San Francisco 2-0 Sunday for a five-game winning streak. "I just want to win the game," Leiter said. "A win is a win. The owner, the general manager, they just want to win the game." New York moved within 1 1/2 games of first-place Atlanta, the closest the Mets have been in the NL East race since July 6. Since July 25, the Mets are 16-3 and the reason is pitching they've allowed just 3.4 runs per game. The addition of Rick White settled the bullpen, Mike Bordick filled the shortstop hole created by Rey Ordonez's season-ending injury, Bubba Trammell and Lenny Harris fit in nicely and Darryl Hamilton returned last week after missing most of the season with a bad toe. "We're going really good right now," Mets manager Bobby Valentine understated. New York handed the Giants, who lead the NL West by two games over Arizona, just their third shutout of the season. Mets pitchers tied San Frncisco for the NL lead with eight shutouts, one behind Boston, the major league leader. In the first three games of the series, New York has outscored the Giants, the No. 2-hitting team in the NL behind Colorado, 9-3. "Livan pitched better than all right ... when you take your team into the ninth inning and it's 2-0, you've pitched a good game," Giants manager Dusty Baker said. "But whether it was 1-nothing or 10-nothing, we still got nothing." Leiter (13-5) retired 19 consecutive batters after Ramon Martinez's one-out single in the first. He allowed just two other runners, on Jeff Kent's single in the seventh and Rich Aurilia's walk in the eighth. Leiter matched the Mets' strikeout high this season, which he set against Atlanta on July 1. But the game was still scoreless in the eighth. "You really elevate your concentration, to think about this pitch, this moment," Leiter said. Hernandez, just 3-7 against the Mets, allowed seven hits and four walks in 7 2-3 innings. He retired 10 straight from the third until the seventh, when Harris, starting at first base for the first time since Sept. 22, 1997, led off with a double. Valentine decided to let Leiter bat with Harris at third and one out. Leiter, 3-for-42 (.071) with no RBIs at that point, didn't try to bunt and struck out. Hamilton then walked and Derek Bell flied out. "I have one of the most pathetic swings," Leiter said with no hesitation. New York finally broke through after Edgardo Alfonzo worked out a walk on a 3-2 pitch leading off the eighth. "I threw a lot of fastballs, but he kept fouling them off, then I missed with one," Hernandez said. After Mike Piazza flied out, Ventura doubled to the fence in right-center. Alfonzo scored without a throw. Ventura, on the DL from June 14-29 because of a bruised right rotator cuff, had been in a 10-for-48 (.208) skid, which had dropped his average to .234. "I think I feel better at the plate," he said. Ventura advanced on Benny Agbayani's groundout, Harris was intentionally walked and Mike Bordick lofted a soft single to right, driving in another run and finishing Hernandez. "I threw my game. I threw a lot of zeros," Hernandez said. "I put up seven zeros, then two runs score. He gave us nothing." With Valentine wanting to rest closer Armando Benitez, John Franco pitched a hitless ninth for his fourth save in five chances. Franco, whose 420 saves are second to Lee Smith (478) on the career list, has accepted his role as Benitez's setup man. The Mets would have traded Franco last winter if he wanted to be dealt, but he told them not to. "The hardest part of the year was the first part of the season," Franco said. "There were situations and the (bullpen) phone rang, and it wasn't for me. You can't sulk. This is a decision I made. You have to make the best of it. "When you're sitting around 10 years down the road and have a ring on your finger, that's more important. Let's face it, Armando has been doing a great job." Swept in a four-game series at Pacific Bell Park earlier this year, the Mets try to complete a four-game sweep at Shea Stadium on Monday night. The first three games of this series were played in cold, damp weather, with rain delays the first two nights. "Fortunately, we got the three games in," Baker said. "But unfortunately, the results weren't good." It was Jewish Heritage Day at Shea Stadium, and "Hatikva," Israel's national anthem, was played before the game. During the seventh-inning stretch, a Yiddish recording of "Take Me Out to the Ball Game" was played, sung by Mandy Patinkin. Hernandez was 0-for-3 at the plate, stopping his five-game hitting streak and dropping his average to .297. He had hit in 12 of his last 13 games coming in.